Located on an island in the middle of the Muonio river, which forms the border between Sweden and Finland, Winter Activity Adventure in Lapland is a wonderful way to experience the beautiful winter landscapes of the far north. An overnight ski tour to wilderness cabin is one of the many activities during the week. Photo: RM. Snowshoeing in the quiet forests. Dog sledding, driving your own team of huskies with sled shared one per two persons. Visit to Sami reindeer herding family. Overnight ski tour using "forest skis" to wilderness cabin. In addition to the included activities, snowshoe and cross-country ski equipment is available to hire for self-guided tours at other times and there are prepared cross-country trails. A snowmobile tour can also be arranged an option for one day. Your accommodation for the week (except for the night spent at wilderness cabin during the overnight ski tour) is in private 2-person or 4-person chalets at the camp, with meals served in the restaurant and use of sauna included each night. 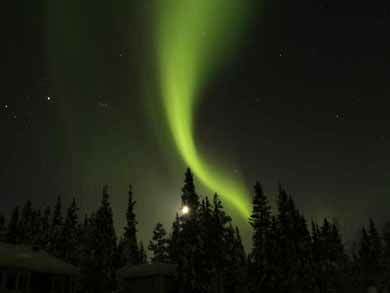 This experience offers good chances to see the Northern Lights during your stay. Photo: RM. 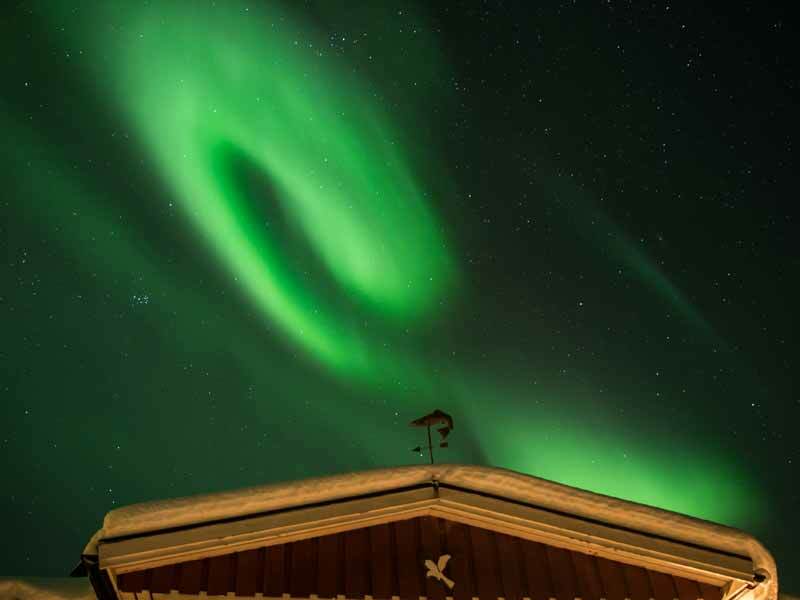 Located 200km above the Arctic Circle and far from light pollution, this is also an ideal place to see the Northern Lights - when conditions are suitable, spectacular displays illuminate the skies above, with the snow-clad pine forests a picturesque foreground to the beauty of the Aurora. As well as taking part in a variety of outdoor activities during the week, on four evenings you will also have presentations on Lapland's iconic predators - the Lynx, Wolverine, Wolf and Bear. The beautiful wilderness area surrounding the camp is important habitat for a range of animals, including wildlife such as moose and the reindeer herded by the indigenous Sami people, and with luck you may spot many tracks and signs of these animals while out on your tours. 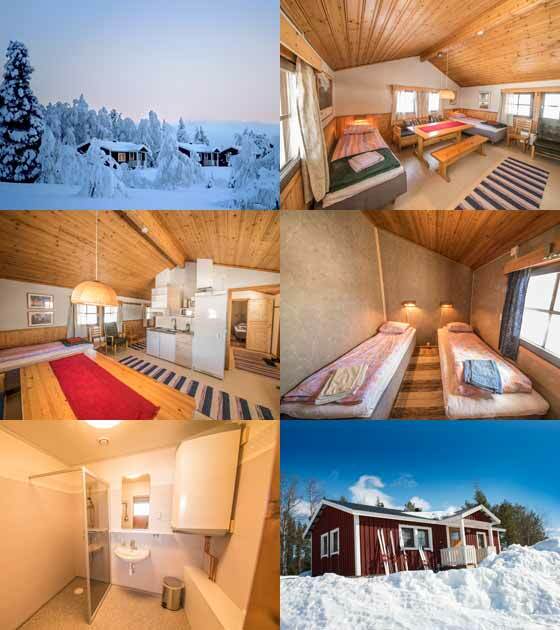 Winter Activity Adventure in Lapland is suitable for adults who wish to experience "real" winter in the far north while enjoying a range of outdoor activities during the week. This is an authentic, traditional outdoor experience in the Lapland wilderness showcasing the very special magic of the winter landscape. Please note that the order of activities during the week may be subject to change depending on weather conditions. You will be met from Kittilä airport (Finland) for transfer (approx. one hour) to the cabins. Transfers are in connection with Finnair flight AY575 from Helsinki arriving 17.50. You are of course welcome to arrive with earlier flight and wait at the airport. On many dates, there are direct flights Gatwick-Kittilä arriving 14.35. Note that Finnish time is one hour later than Swedish time. On arrival, there is a welcome drink and presentation of the week before dinner is served in the restaurant. After dinner, you have the first of four wildlife presentations of the week, focusing on four of Sweden's most iconic animals. Tonight, it's the turn of the shy and rarely-seen Lynx. After breakfast, you head out for a guided snowshoe tour in the quiet wilderness surrounding the camp. Snowshoeing requires no previous experience and is a wonderful way to explore the winter landscape. This is an opportunity to learn about the flora and fauna of Lapland from your guide - you will look for tracks in the snow and learn about how animals and plants adapt to the challenging climate. Lunch is taken outdoors by the fire in the forest before continuing your snowshoe tour in the afternoon, making your way back to the cabins for dinner at the restaurant. Tonight's wildlife presentation is on the rare, beautiful and much misunderstood Wolverine. Today you will be taking to the trail for a dogsled adventure, driving your own team of huskies with sled shared one per two persons. After breakfast, you have transfer to the kennels (approx. 20 mins) to meet the dogs, before setting out for a husky tour of around 17km. The dogs are friendly and enthusiastic, and you'll quickly become best friends! After lunch, you try the "forest skis" that you will be using later in the week for your overnight tour. These are simple cross-country style skis which can be used with normal winter boots and which are ideal for skiing in landscapes of deep snow and unprepared trails. After dinner, tonight's talk takes you into the mysterious world of the Wolf. Today you have the freedom to plan your day as you wish. After the last few days' activities, you may wish to simply take it easy and enjoy the surroundings of the camp. If you're still in the mood for adventure, snowshoes and cross country skis are available to hire for self-guided tours in the surrounding area, or snowmobiling can also be arranged. This evening's talk is on the majestic and powerful Bear. The Sami are the indigenous people of the north, and their lives today combine a strong connection to the traditions of the past and maintaining their reindeer herding heritage, while incorporating the many benefits the modern world has to offer. You will meet a Sami family and learn about life as a reindeer herder, before having a traditional Lapland lunch. In the afternoon you return to the cabins with dinner in the evening. During the week you will have tried a number of different winter activities and by now should be well-used to winter life in Lapland! Today you set out for an overnight ski tour using the forest skis you tried earlier in the week, skiing over frozen lakes and marshland and through the pine forest. This area is important for both reindeer husbandry and wild moose, and you may need to adapt your route to minimise disturbance to the animals. You will need to carry only a day-pack, as your main luggage for the night will be transported to the cabin. Distance is variable but is typically around 10km. 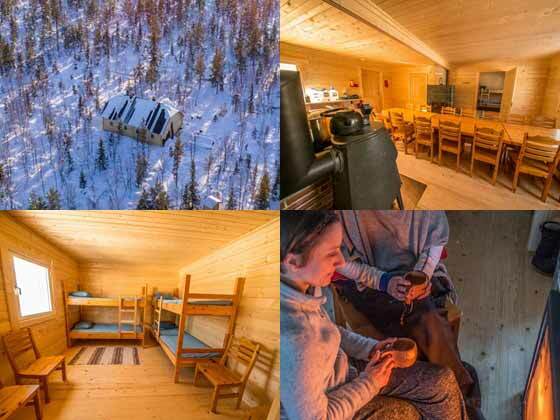 The newly-constructed wilderness cabin offers simple but comfortable accommodation, with no electricity or running water and sleeping accommodation in shared rooms with bunk beds. The cabin is heated by wood-burning stove and water is prepared by melting snow. 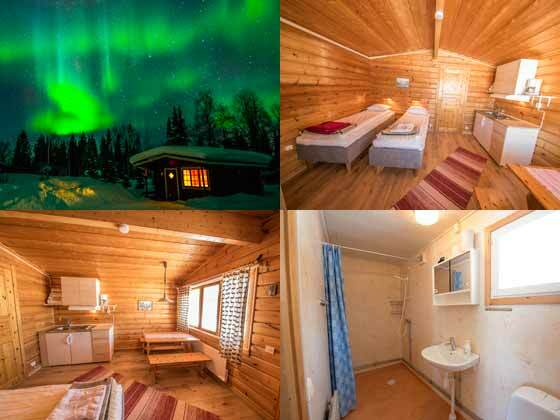 Everyone joins in to prepare dinner and heat the sauna for the evening - perhaps you'll brave a roll in the snow while having your sauna, hopefully with the Northern Lights shining above! After breakfast you pack for return by skis to the camp. With luck, you may spot tracks and signs of wildlife such as the lynx or wolverine, about which you have heard earlier in the week, and the area also has a large population of moose. Distance is variable but is typically around 10km. Once back, it's time for a sauna and your last dinner together in the restaurant. Breakfast and transfer to Kittilä airport (Finland) for departure. Transfers are in connection with Finnair flight AY574 to Helsinki departing 13.35. You are of course welcome to wait at the airport and depart with a later flight. Note that Finnish time is one hour later than Swedish time. The majority of dates run Sunday-Sunday. 29.12.18-05.01.19 (New Year tour, Saturday-Saturday). Then weekly Sunday-Sunday from arrival 06.01.19 to latest arrival 07.04.19 (latest departure 14.04.19). Snowmobile tour: An option for activity on Day 4 of the standard itinerary. Uses shared snowmobiles one per two persons, approx. duration 2.5 hours, total distance around 30km. Note that full driving licence is required for person(s) driving. Price €166/person. 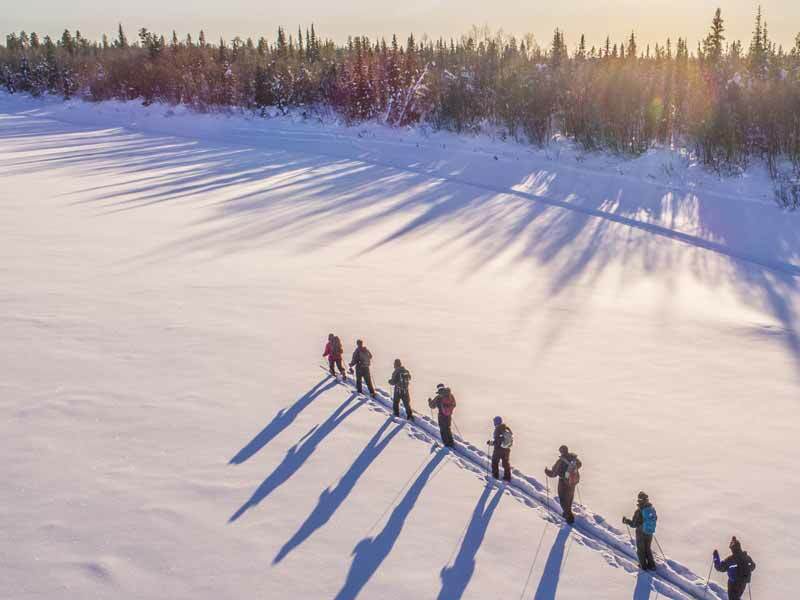 Snowshoes or cross country ski equipment: For self-guided activities outside standard itinerary (equipment is provided for the guided tours included in the itinerary). Price for snowshoes €14/day or €70/week. 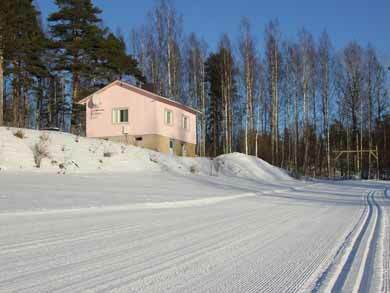 Price for cross country ski equipment €20/day or €100/week. Both "forest" and "proper" cross country skis are available - please specify on booking. 6 nights in private 2-person chalets (if 1-2 persons) or 4-person chalets (if 3-4 persons) with 2-bed rooms. Chalets are simple but comfortable and have own WC/shower. Bedding and towels are included. 1 night in shared rooms at wilderness camp during overnight ski tour. Camp has no electricity or running water and is heated by wood-burning stove. Dry, outside toilet facilities. Guests will need to bring own light sleeping bag and liner for this night. Sauna is available every night at both the camp and wilderness cabin. Sauna at the camp is electric and at the wilderness camp is wood-fired. Meals: All meals are included from dinner on Day 1 to breakfast on Day 8. Meals are served in the camp restaurant for dinner and breakfast (except for night at wilderness camp). Lunches may be outdoors during activities depending on the itinerary. Drinking water is always available and tea/coffee are included in connection with meals. 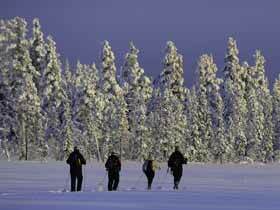 Equipment: All equipment for activities included in the itinerary (snowshoes, forest skis, dogsled equipment). Snowshoes and skis are available for hire for self-guided tours at other times. Transfers: Transfers between Kittilä airport and the camp on arrival/departure day in connected with fixed flight times; local transfers as required for included activities. Luggage Transfers: Between camp and wilderness cabin for overnight ski tour Day 6-Day 7. Wilderness cabin for overnight ski tour. Photos: RM. Alcoholic drinks and other drinks outside mealtimes (drinking water is of course always available). Snowshoes or ski equipment except as required for included activities (available to hire for self-guided activities at other times, paid locally). Both "forest" and "proper" cross-country skis are available to hire and there are prepared cross-country trails starting right from the cabins. Optional snowmobile tour Day 4 (paid locally). You should be in good health with a normal level of fitness and enjoy the outdoors. No previous snowshoeing or cross country skiing experienced is required. For night at wilderness cabin, you should be used to living in close proximity with others. The experience is based at simple but comfortable accomodation. During day activities, you will be outdoors in winter conditions for extended periods, but the day activities have a generally accessible level of challenge. The overnight ski tour has a higher level of physical challenge, but luggage transfers are included to the wilderness cabin and so it is necessary to ski only with day pack. Max. group size 16 persons. This experience is suitable for private groups - please contact us to discuss your requirements. This activity has received a prestigious Swedish Ecotourism certification for commitment to high standards to cultural and environmental sensitivity. Fly to Helsinki for domestic flight to Kittilä (1.5 hours). From Kittilä airport, transfers to the camp (approx. 1 hour) are included in connection with fixed flight times. Compare our winter accommodation experiences. 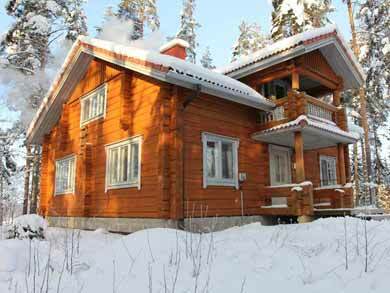 When to go for a winter log cabin or lodge holiday. Read our blog article about the Sami people.